From scripts and PowerPoint presentations to agendas and handouts, The Essential Literacy Workshop Book provides trainers with everything they need to train teachers to develop children's literacy skills. 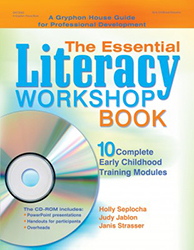 Perfect for trainers and directors, The Essential Literacy Workshop Book has ten complete, three-hour training modules. The accompanying CD-ROM contains PowerPoint presentations and files of the overhead transparencies and handouts. This package provides a complete in-service program for groups of any size.